Truck Grill Guards- The "Moose Bar"
Grill Guards Built for Moose? 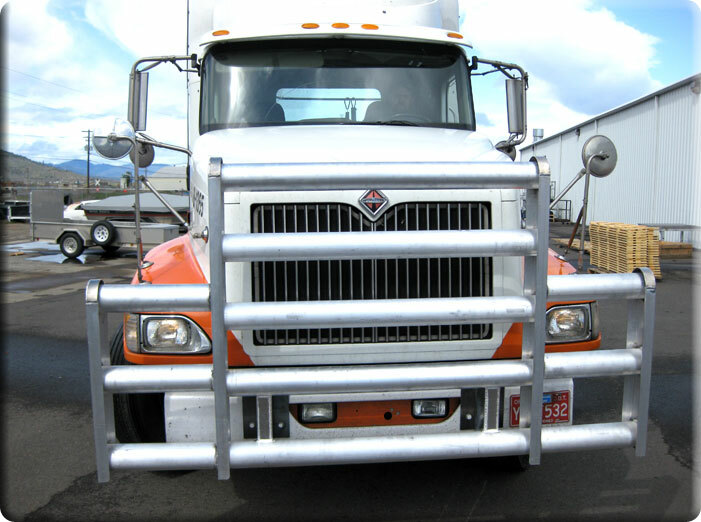 If you have trucks traveling in the northern states or countries, our aluminum "Moose Bar" may save you the cost of a new front clip. Not to mention the down time. Made from heavy wall aluminum T-6 alloy tubing and structural channel, this unit is not only tough as they come but it looks as tough as they come also. It bolts to the frame in front of your existing bumper giving you a solid mounting system. Two pins, similar to the pins used on your trailer hitch, pull out allowing the "Moose Bar" to hinge all the way forward where it lays on the ground. This allows full access to the front of your truck, even with the hood open. Since there are a number of sizes of trucks, we make these units to order. Call for more info. (3) Download our PDF version now.